This is a really good Italian, main course soup. It comes together very quickly so you can enjoy it any night of the week. Very hearty and healthy, each huge 2 cup serving has 245 calories, 6 grams of fat and 6 Weight Watchers SmartPoints. 1. In a small microwave safe bowl, add onions. Cook in microwave for 2 minutes, to soften. 2. Coat a large, nonstick pan or pot with cooking spray. Add sausage pieces, cooked onions and garlic. Cook and stir over medium heat for 2 minutes. Stir in all broth and tomatoes. Bring to a boil. 3. Stir in tortellini and return to a boil. Cook for 5 minutes until pasta is almost tender. Stir often. Reduce heat, mix in spinach, basil, black pepper and pepper flakes. 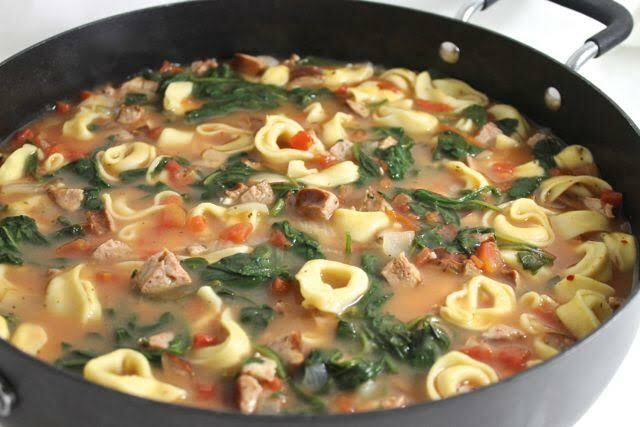 Cook for 2 minutes until spinach is wilted and tortellini is tender. 4. Ladle into bowls. Top with a little Parmesan cheese, if desired. ThIs soup freezes great, too. Since the pasta absorbs some of the liquid, when reheating, you might need to add a little more chicken broth. Makes 12 cups total, 6 main course serving. Each serving, 2 cups. I love Trader Joe's chicken and herb sausages. They are fully cooked. So lean, they're all natural and gluten-free. Each has only 7 grams of fat. If you don't have a Trader joe's, use any lean chicken or turkey sausage. Make sure they are fully cooked. I used Trader Joe's Cheese Tortellini. It's fresh pasta and found in the refrigerated section. Most supermarkets carry a few brands, such as Buitoni.